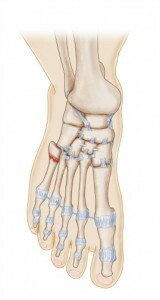 It is located about ½ inch distal (further from the body) to the projecting part (the tuberosity) of the fifth metatarsal. A Jones fracture is often mistaken for a sprain or an avulsion fracture. This is why it’s important to have your injury diagnosed as soon as possible. The area of the Jones fracture has a very small blood supply. Jones fractures disrupt that blood supply and can take much longer to heal, and may require surgery for treatment. It is also important to get a proper diagnosis, because a true Jones fracture often results in a non-union (the permanent failure of a bone to heal) if it is not identified and managed properly. Jones fractures can be acute (sudden) or chronic. Often there is a stress reaction in that area of the bone which has predisposed the area to injury. Sir Robert Jones was the first to describe the Jones fracture in 1902. He said that he incurred the injury while dancing. In fact, the Jones fracture is also known as a Dancer’s fracture, since many people incur this injury while participating in activities such as dancing. How Can I Tell I Have a Jones Fracture? How Did I Get a Jones Fracture? In most cases, a Jones fracture is attributed to a twisting inversion injury to the foot. Inversion injuries happen when the foot or ankle twists inward. Overuse, repetitive stress, and trauma are the leading causes of Jones fractures. If you injure your fifth metatarsal bone, you should seek medical attention as soon as possible. This can prevent the problem from worsening and catch any other damage in its early stages. Your doctor will perform an x-ray to determine the extent of the fracture, to confirm that it is indeed a Jones fracture, and to make sure there is no other damage. If the Jones fracture is not significant, it is typically treated with a cast, splint, or walking boot for six to eight weeks. This treatment is sufficient for 75 percent of mild Jones fractures. Patients are advised not to put weight on the injured foot until so instructed by their doctor. For athletes, or those who incur an acute Jones fracture, surgery may be required. You may be given NSAIDS (non-steroidal anti-inflammatory drugs) to reduce pain and swelling during the healing process. In most cases, rehabilitation can begin once the cast is removed, and you will gradually be able to resume your normal activities. Rehabilitation may take an additional two to three weeks. Your age may also play a role in healing time. Younger people are known to heal faster from bone injuries. If there is delayed healing, a bone stimulator may be used. Jones fracture surgery is usually performed if the fracture is displaced, if it does not heal properly, or if the problem is chronic. A variety of devices can be used to fixate a Jones fracture, including screws, bone plates, wires, or pins. Sometimes a physician will also use a bone stimulator to assist the bone healing. The foot is then cast so that the bone is protected during the healing process. If you only have a mild Jones fracture, surgery should not be necessary. Casting is usually all that is needed to treat a mild Jones fracture. Keep weight off the healing foot. Use crutches, a splint, or a walking boot at all times, unless resting. Rest as often as possible; the healing process can take four to six weeks. Increase your intake of vitamin D and calcium. If the Jones fracture fails to heal correctly, the patient may be required to wear the cast for up to twenty weeks. The fracture can then become a chronic condition. Jones fractures do not heal easily due to the lack of adequate blood supply to the area. Almost 75 percent of all Jones fractures eventually heal properly, however, and do not recur. How often do you treat Jones fractures? Should I use the PRICE method (Protect, Rest, Ice, Compression, Elevation) during the healing process? What symptoms should I watch for that would indicate the injury is not healing properly? What should I do if I cannot be immobilized for the duration of the healing process? Does this type of fracture have the potential to recur? What complications may arise in the future, after the fracture has healed? What shoe gear is recommended?